Feb 11 (AZINS) With Telugu Desam Party chief N Chandrababu Naidu sitting on a daylong fast here, BJP president Amit Shah Monday said the Andhra Pradesh chief minister knows that his political fortunes are declining rapidly and so he was back to theatrics in his desperation for grabbing headlines. In an open letter to people of Andhra Pradesh, Shah accused Naidu of breaking their trust and said he is going too far by "personally" attacking Prime Minister Narendra Modi.Naidu's "delusional politics" is about to end, he said,adding that the BJP has full faith in 'Satyameva Jayate' (truth prevails).The TDP leader had recently taken the name of Modi's wife in attacking him. Naidu claimed he did so as the prime minister had referred to his son in targeting him in a rally. Naidu's daylong fast demanding special status for his state on Monday became a rallying point for the opposition, which got together for the second time in less than a month to present a united front against the government.In his letter posted on social media, Shah said people will teach Naidu a befitting lesson in the coming elections for joining hands with the Congress, which bifurcated the state in a "unilateral, hasty and unscientific manner, ignoring" its interests. The assembly elections in the state will be held simultaneously with the Lok Sabha polls.Lashing out at Naidu, Shah said his party is aware that Naidu has "Congress blood" in him but it never expected that he will go to the extent of even surpassing the Congress in speaking lies and in carrying a "hate campaign" against the central government, Modi and the BJP. The Andhra Pradesh chief minister had started his politics as a Congress member and joined the TDP, which was founded by his father-in-law N T Rama Rao, later. With Naidu now in an alliance with the Congress, Shah mocked him for joining hands with a party which imposed Emergency and dismissed the N T Rama Rao government in 1984.Sensing defeat in the coming elections, he has made multiple U-turns and is carrying out a malicious propaganda against the Centre and the BJP leadership to divert people's attention from his failures, the BJP president said.In his long letter, Shah cited a number of central projects being taken up in the state in addition to those mentioned in the Act that divided it in 2014 -- leading to formation of Telangana. Various ministries have approved additional projects to Andhra Pradesh with an outlay of more than Rs 3 lakh crores, Shah said, asserting this illustrates the manner in which the Union government prioritised its assistance to the state.Responding to demands of special category status to the state, he said the Centre has been constrained by the 14th finance commission's recommendations which, he added, did not make a distinction between special and general category states for financial support and tax devolution. 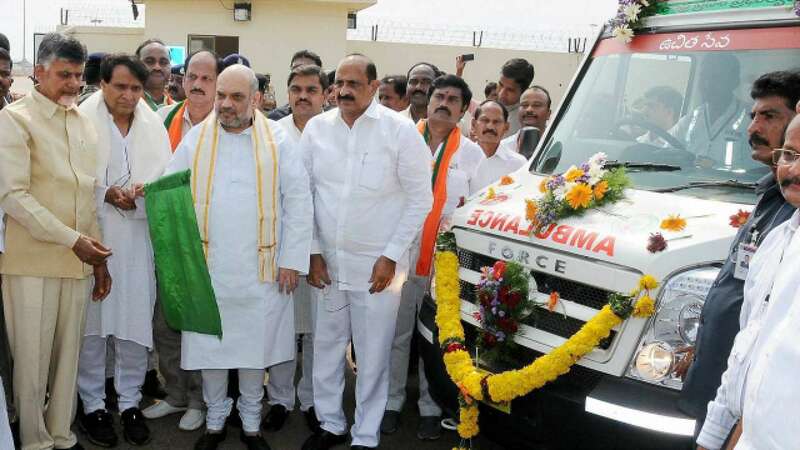 As a result, the Centre in consultation with the state government worked out special assistance for Andhra Pradesh, Shah said.Hitting out at Naidu for his "U-turn", the BJP chief said he had hailed the special package announced on the assembly's floor and in several public forums, and had even declared that a special category status was not a panacea and did not help states' development. "In fact, the Andhra Pradesh assembly had passed a resolution thanking the Central government for approving a special economic package for the state," Shah noted. Apparently, panic has set in now and the TDP leader is scared that his omissions and commissions would be exposed, he claimed. "That is why he is going to the extent of accepting the leadership of the Congress which has ruled and ruined the country, compromised the integrity of every institution and is neck-deep in scams and scandals," he said.